The Kawasaki Motorcycles women love to ride! This is Tina from Pennsylvania and she is riding a 2007 Kawasaki Ninja 650. 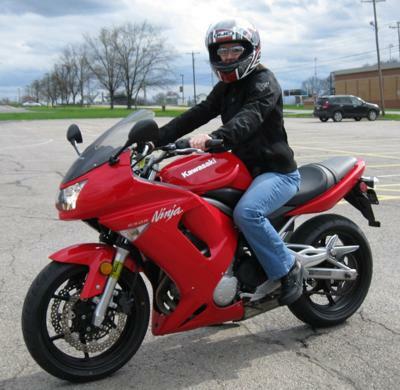 In the late spring of 2011 Tina visited her-motorcycle.com and shared with us the reasons that she likes Kawasaki motorcycles and why she chose this bike over a 2008 V-Star. Here is Tina's original post called 2007 Ninja 650. Her-motorcycle.com has been asking our visitors since 2007 to share with us their opinions on Best Bikes. And since that time we have accumulated quite a large collection of articles about a lot of different motorcycles. This page that you are visiting is our collection of the Kawasaki Motorcycles that women love to ride, sent to us by our visitors, over the years since 2007. These are the honest opinions, in their own words, of the women who ride these motorcycles. There is nothing here that is professional written by paid writers! I hope you enjoy reading our collection of articles on Kawasaki Motorcycles and please leave a comment. I love the Kawi 900 well balanced and tons of power. Love it Love it. I love my bike. It's white with Pink "accents". I painted it myself. The looks and comments I receive on this bike are priceless. This is my very first bike and I love it. I drive a 2009 Kawasaki ZZR600. My bike is beautiful and "she" has lots of attitude. Sandy & Lindsay...Adventure is just a twist of the throttle away! My first bike - a 2008 Kawasaki Vulcan Classic LT 900. Not to big, definitely not too small; keeps up with the big boys; even with a passenger! The Vulcan is my second bike since I started riding just a few years ago.